Llanelidan, Ruthin, North Wales LL15 2LG U.K.
Streptocarpus, although having a leaf similar to primroses, are not related to them, but belong to the Gesneriad family, which also includes African Violets (Saintpaulias), Columneas and Achimines. Streptocarpus fall into two distinct groups: those with stems, the Streptocarpellas, for example Streptocarpus saxorum, and the more commonly known types with a rosette of leaves. It is from these rosette types that the modern hybrids have been bred. These rosette species inhabit wooded ravines and valleys of the Drakensburg mountains of Southern Africa. The first to be introduced into this country was Streptocarpus rexii in 1826. This has bluish flowers, but soon many other species followed and many crosses were made resulting in the hybrids found in many present-day seed mixtures. The first of the modern named hybrids was 'Constant Nymph', bred at the John Innes Institute in 1946. In 1969, the John Innes Institute did more crosses involving other colours and produced the free flowering varieties which form the base of our range. We have also added the pick of World-wide varieties. Continued breeding work at our nurseries is adding good new plants to what is undoubtedly the best selection of named hybrids available in the world. Knowing their geographical distribution helps in understanding their care. Remember, they come from the wooded areas in mountains, so they do not want full sunshine, but they do want a bright position. Too much sun burns the leaves and fades the flowers. Keep them in a shaded greenhouse or indoors in an East or West window. When you receive your plants, pot them into 3 1/2" pots as soon as possible using a good peat or fibre based potting compost. Shading is especially important for the first few days. Within a few weeks the plants should begin flowering. Water regularly from either above or below only when the plant requires it. It is important not to overwater Streptocarpus, wait until the compost feels dry to the touch. Overwatering, in particular regular overwatering, will cause harm to the root system. The first symptom of overwatering is exactly the same as underwatering i.e., the plant will wilt. So make sure the compost is actually dry in between watering. A month after potting up commence feeding with a high potash fertiliser. The most convenient way is to insert a Dibleys Streptocarpus fertiliser tablet each month. Please remember every lant is a separate individual and should be treated as such. Always cut off dead flowers. Excessive or incorrect feed and poor light make the plants produce very large leaves and few flowers. It is quite natural as plants age for the old leaves to die back, and the ends should be trimmed off, especially in winter. In winter, water less often, do not feed and keep the plants in a place free from frost. In March or April gradually start watering more often and commence feeding. Plants should be potted into a slightly larger pot each spring. Do not over-pot you will get more flower by keeping on the pot bound side. Using half of three quarter depth pots is a good idea. Given this treatment you will be rewarded by a continuous display of flowers from about May until well into winter. You will also find the flowers are good for cutting. 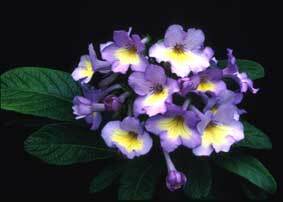 Streptocarpus are easily grown plants which are remarkably free from pests and diseases. Greenfly occasionally attack plants and can be spotted from their white discarded skins on the flower stalks and leaf bases. A spray with a proprietary insecticide either as an aerosol or mixed with water will soon cure the problem. We largely use biological control of pests on our nursery and have found the method very successful. It must be noted however that biological methods alone may only control pests but not eradicate them. Biological control can be done on an amateur scale in a glasshouse or conservatory. Supplies are available in the UK from from: Green Gardener, 41 Stumpshaw Road, Brundall, Norfolk, NR13 5PG. Rot can occur at the base of the leaves causing the leaves to wilt. Remove the damaged leaf and check that the growing conditions are correct, taking special care to see that overwatering is not occurring. Please do not send diseased material to us, we do not want to run the risk of introducing pests or diseases into our nursery. We are the holders of the U.K. National Collection of Streptocarpus. We have been awarded many prizes for our plants including 25 Gold Medals from the Chelsea Flower Show. Use the links below to find out more about Streptocarpus plants. Don't forget to subscribe to our eNewsletter by filling in the form below! Factsheet 1 - How to propagate your plants from leaf cuttings. Factsheet 2 - Over-wintering streptocarpus plants. Factsheet 3 - Propagating streptocarpus by seed. Factsheet 4 - Streptocarpus: diseases and pests. Factsheet 5 - How to treat your plants during the winter. > Streptocarpus: A brief study in Mpumalanga and the Royal Natal National Park. An article by Lynne Dibley recounting her hunt for Streptocarpus plants in South Africa during January 1997. > National Plant Collection® of Streptocarpus. Find out more about our National Collection. > Dibleys at the Chelsea Flower Show. Have a look at some of our older displays at the Chelsea displays at Chelsea from 1999.